1. Preheat the oven to 220˚C, gas mark 7. Put the classic vine tomatoes in a roasting tin with the courgettes. Toss with 2 tsp oil, season and roast for 15 minutes. Toss through the cherry tomatoes, return to the oven for 15 minutes, then set aside. 2. Meanwhile, heat the remaining 3 tsp oil in a large, heavy-based saucepan. Add the onion, celery, carrot and garlic; season and cook gently for 10 minutes, until softened. Turn up the heat a little, add the rice and wine, then cook for 2 minutes until the wine has almost evaporated. 3. Take the larger roasted tomatoes out of the tin and blend with the stock until smooth. Tip into a separate pan and keep warm over a low heat. Stir 2 ladles of the warm stock mixture into the rice, then reduce the heat and simmer until most of the liquid has been absorbed. Stir in another 2 ladles until almost absorbed. Continue to cook in this way for 20 minutes, until the rice is al dente and the risotto has a loose consistency (add a little extra stock mixture or warm water if needed). 4. 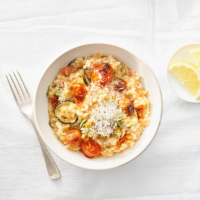 Take the pan off the heat and stir through the cherry tomatoes, courgettes, basil, lemon zest and juice, and most of the parmesan; season. Serve scattered with the remaining parmesan and with the lemon wedges alongside.